Snow is continuing to fall in parts of the South this afternoon, as a cold snap sends temperatures plummeting. Southern District police said it was snowing heavily around the Crown Range Summit at 3pm. Motorists were advised to drive to the conditions, carry chains if heading over the Crown Range Rd linking Queenstown and Wanaka, and allow extra time for travel. Snow had been forecast down to 800m and was also affecting some Central Otago high country tracks today. The southerly front blasting parts of country should be gone by the weekend - but not before it dumped snow at the Cardrona Alpine Resort skifield near Wanaka this morning. Cardrona's spokesperson Jen Houltham said by 10am, 5cm-10cm of snow had settled and "isn't showing signs of letting up!" 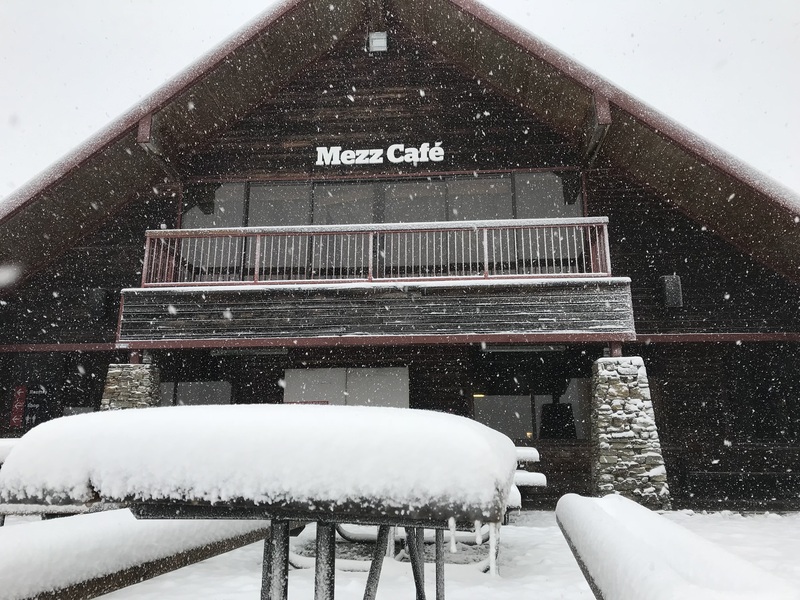 The skifield got a good dusting in early February after a cold snap caused by Cyclone Gita brought snow to Queenstown and Wanaka and closed the Crown Range Road. The Central Otago District Council said this morning that Danseys Pass Road was restricted to 4WD vehicles due to snow. Snow was also affecting other high country tracks in the district and travellers should avoid using these until conditions improved, it advised. Temperatures have dived with the southerly system’s arrival. Dunedin had basked in 25degC warmth at the start of the week but now had a forecast high of just 12degC today. They'll be shivering in Wanaka and Queenstown also, with a forecast high of 11degC and cold southerlies. Oamaru was forecast to reach 12degC. Christchurch dropped 10degC, from 24degC yesterday to 14degC today, while Invercargill would be a bracing 13degC. The slow-moving southerly front arrived in Fiordland and Westland early this week, dumping more than 300mm of rain, before slowly moving east across the South Island and north to Taranaki yesterday. It was expected to affect the upper South Island through to Saturday morning, bringing periods of heavy rain to northwest Nelson and northern Buller. MetService has issued severe weather warnings for that area from 10pm tonight to 6am on Saturday. Rain was expected to become heavy at times from tonight through Friday and into Saturday morning with 130mm to 160mm potentially falling. There have already been reports of isolated torrential rain falling in Nelson and flight disruptions. The heaviest falls were expected from Friday afternoon until Saturday morning and hourly rates may reach 20mm to 30mm. WeatherWatch NZ head forecaster Philip Duncan said the cold front with a broad band of rain would move to the North Island today, bringing showers and even some isolated thunderstorms. From Thursday afternoon, heavy downpours and isolated thunderstorms were possible in the central part of the North Island, ahead of the front. On Friday, showers and (isolated) thunderstorms with wind gusts along the front are likely in Taranaki, Nelson and northern Westland. By the weekend, showers and any thunderstorms will be over the northern and eastern parts of the North Island. Thunderstorms were possible in Northland and Auckland until Sunday.